Today, I'm featuring some of my favorite Technicolor scenes from old Hollywood films. 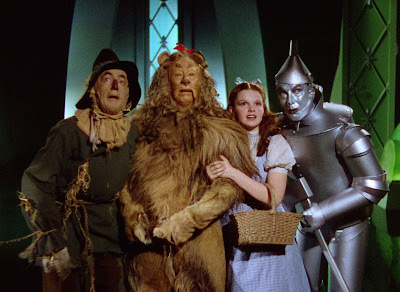 Here's The Scarecrow (Ray Bolger, left), The Cowardly Lion (Bert Lahr), Dorothy (Judy Garland), and The Tin Man (Jack Haley) on their way to meet the Wizard in the Technicolor masterpiece, The Wizard of Oz (1939). Many of old Hollywood's most beloved films wouldn't be the same without Technicolor, a color photography process that was widely used during the golden age of the studio system. Technicolor made Sherwood Forest brilliantly green in The Adventures of Robin Hood (1938), created fiery red flames during the burning of Atlanta in Gone With the Wind (1939), and made the yellow brick road shine in The Wizard of Oz (1939). TCM is celebrating the 100th anniversary of Technicolor with a 48-hour film festival on July 7-8 with some of the best Technicolor films (technically, they're celebrating the incorporation of the Technicolor company; the Technicolor process wasn't actually invented until 1916, but what's a year between cinephiles). There has been color photography almost as long as there have been movies. Some early films were painstakingly hand-painted to create color. Other filmmakers dyed the negatives to create a mood; for example, silent films were often tinted blue during night scenes. In 1916, MIT graduates Herbert Kalmus and Daniel Comstock began perfecting Technicolor, a complex photography process that uses three strips of film to create richly saturated hues that justly earn the title, "glorious Technicolor." 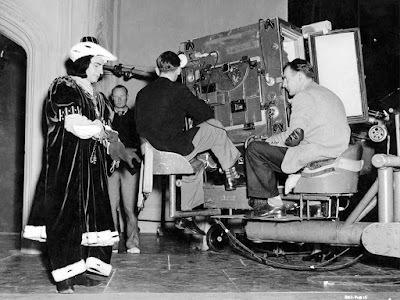 A behind the scenes photo shows Laurence Olivier standing beside the bulky Technicolor cameras on the set of Richard III. Many filmmakers in the 1920s used an early form of Technicolor in movies like The Ten Commandments (1923) and the Douglas Fairbanks swashbuckler, The Black Pirate (1926). One of the most easily accessible silent films is The Phantom of the Opera (1925), starring Lon Chaney as a deformed man who haunts the Paris Opera House. This movie has both hand painting and dyed negatives, but Universal Studios used Technicolor in the masquerade ball scene (clip below) where the Phantom arrives resplendently dressed as The Masque of the Red Death. The scene still has a great deal of impact in 2015 -- not only because of the elaborate set, which is an exact replica of the Opera House's grand staircase, and Chaney's brilliant pantomime style of acting (he can do more in a mask than most actors can do in a full close-up) -- but also because of the use of color in the scene. The elaborate gowns are the last word in Roaring Twenties chic, and the Phantom's blood-red costume is both terrifying and beautiful. Technicolor didn't immediately take off despite box office hits and critical raves. The Technicolor cameras were large and bulky, and the introduction of sound in 1929 dampened Hollywood moguls' desire for new innovations. Kalmus introduced a simpler form of Technicolor called the three-strip process in 1928, but, at first, only independent producers like Walt Disney and David O. Selznick gambled on the new technology. Technicolor's breakthrough into mainstream films came in 1938 with Warner Bros. glorious swashbuckler, The Adventures of Robin Hood. Warner's publicity department trumpeted, "Only the rainbow can match its brilliance," and that wasn't just old Hollywood ballyhoo. It's a pity that this movie doesn't make more "great movies" lists because it is a thing of beauty and a joy forever as you can see from this clip where Robin (Errol Flynn) competes in disguise at Prince John's archery tournament. 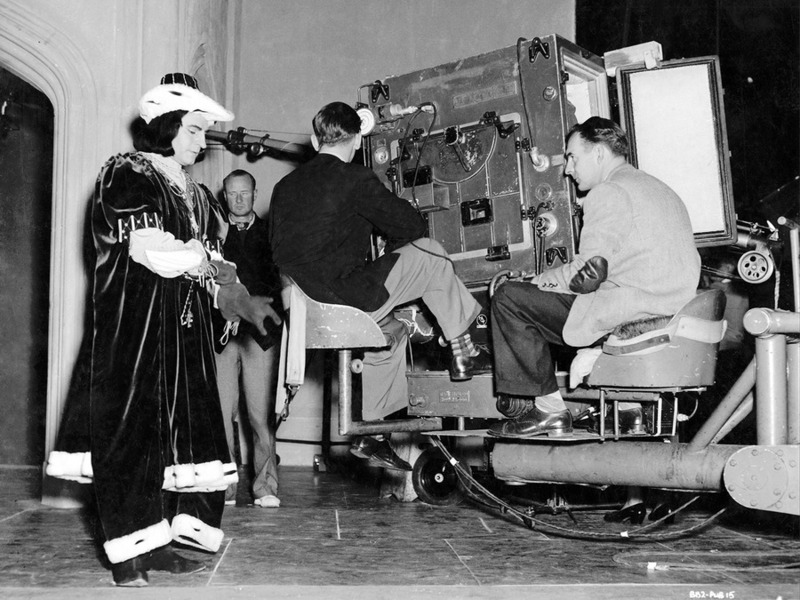 The Adventures of Robin Hood was a blockbuster, so almost every major studio rushed Technicolor films into production. Warner Bros. re-teamed Flynn and Olivia de Havilland in Dodge City and The Private Lives of Elizabeth and Essex, 20th Century Fox put Shirley Temple in a lavish production of The Little Princess, and, of course, MGM had The Wizard of Oz. If there is such a thing as a universal cinematic experience, then Oz is it. Men, women, and children across the globe have marveled at Dorothy's entrance into Technicolor Munchkinland from the drab, grey interior of her Kansas home (clip below) ever since the movie's release. Animation was a natural choice for Technicolor, and Disney was one of the first Hollywood studios to embrace the new technology. Disney first tried Technicolor in a 1932 Silly Symphonies short, Flowers and Trees. That cartoon was an unexpected smash with theater owners reporting that audiences were lining up to see the short subject instead of the feature film. Disney made the first animated feature film, Snow White and the Seven Dwarfs, in 1937, but the studio's best Technicolor work was probably in Disney's 1940 masterpiece, Fantasia. The clip below is the dance of the sugar plum fairies sequence. During World War II, Technicolor was widely used in musicals. Fox pumped out a string of Technicolor movies featuring pin-up queen, Betty Grable, to cheer up the boys on the front lines (and no doubt the boys on the homefront too). While the Grable musicals are entertaining, they didn't advance Technicolor as an art form. That task fell to a young theater director named Vincente Minnelli, who came from New York in the early 1940s to direct films for MGM's musical production unit. Minnelli's second film, Meet Me in St. Louis (1944), is a simple tale about a Midwestern family who are moving to New York just before the 1904 World's Fair in St. Louis. Although Meet Me in St. Louis is still renowned as a heartwarming family film, dark currents run underneath the surface, especially in the youngest family member, 6-year-old Tootie (Margaret O'Brien), who struggles with the joys and terrors of growing up. In the scene below, Minnelli subtly contrasts the rich reds and greens of the Christmas season with Tootie's anguish at leaving her beloved home. Part 2 is coming tomorrow, but feel free to chime in with your own Technicolor favorites. The Phantom of the Opera: Streaming on Hulu or DVD. Note: This movie is in the public domain so it is widely available through YouTube and other media sharing sites. The Adventures of Robin Hood: Streaming on Watch TCM until July 14. Also available on DVD and video on demand. The Wizard of Oz: DVD and video on demand. Meet Me in St. Louis: Streaming on Watch TCM unitl July 14. DVD and video on demand. Perfect examples of Technicolor, Amanda. This was really fascinating. By the way, Fantasia was on Netflix a couple of months ago (along with the disappointing Fantasia 2). I don't know if it is still there, but it was great to see it again! Thanks! I checked and Fantasia is still there. Ill add it into the article and re-watch it again.